Situated on 12 acres of landscaped gardens, the DoubleTree by Hilton Hotel and Spa in Chester, which is managed by Valor Hospitality Europe, offers stylish accommodation, a Marco Pierre White Steakhouse Bar & Grill, a sumptuously decorated lounge and bar as well as a spa and fitness centre, and flexible event and meeting rooms. As part of a significant redevelopment programme, TORMAX was contracted to manufacture and install a revolving entrance door combined with an automatic swing door, giving clear and easy access to the grand reception area. 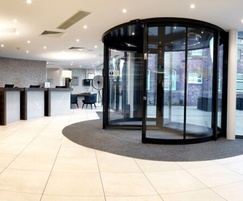 TORMAX installed a contemporary, 3-wing automatic revolving door to the refurbished reception. Providing a prestigious access solution that blends seamlessly with the original 18th century manor house and the modern 79-bedroom extension wing, the revolving door is powered by the TORMAX 5201 operator, ensuring ongoing safe and reliable access, even on the busiest of day. For a comprehensive solution, a TORMAX 1201 automatic swing door was installed to one side of the revolving door. “A TORMAX revolving entrance combines timeless elegance with a technologically advanced door drive, that delivers ongoing reliability long into the future,” said Roberts. “The convenience of a swing pass door ensures a warm welcome for all visitors, including wheelchair users for example, or those with bulky suitcases.